It is no secret that American businesses start to look north when the Canadian dollar is lower and the American economy is picking up. This is because they see Canada as a place they can save and grow at the same time. Basically a lower dollar is both good and bad, depending on your place in the economy. The hospitality and tourist sectors, exporters and particularly Canadian manufacturers (which have been steadily losing market share in the world marketplace), are among the major winners. So too are the people employed in these industries. Experts argue that a 70¢ or 80¢ dollar is probably closer to fair value, and therefore a good thing for Corporate Canada and the broader economy. Canada’s tourism industry traditionally gets a big boost when the dollar is appealing to those south of the border. This is further enhanced when American media like The New York Times recently released its list of 52 places to visit in 2016 – and Toronto comes in at No. 7. This past weekend brought thousands of American to Toronto for the first NBA All-Star game outside of the USA. Even many who did not have tickets for the game that just wanted to be here for the experience. While the Canadian film industry has been steady the past several years, a lower dollar will bring even more productions north of the border, understanding what a deal this is for them. They get some of the best production crews in the world for as much as 30% off what they would be paying in the USA. Not only do they save on crew costs, but they save on equipment rental costs, studio costs, location costs and even production office-space costs. It is not just manufacturing, tourism, cross-border retail and the film industry that see the benefits of the lower dollar, but the companies who supply them with products and services also see an increase in sales and profits. Suppliers to these industries will often hire additional staff when the demand is higher for what they are selling or doing for these industries. Canada also has a technology sector that benefits from a lower dollar. Consumers of the tech products and services from around the world start looking at Canadian solutions just based on the cost savings too. Canada’s tech companies are some of the best in the world, with some of the top products and services. But when the dollar is too high, those looking for the solutions offered by the Canadian tech sector tend to try to seek cheaper (and sometimes inferior quality) solutions, simply to save money. Even American technology companies look to Canada as a place to set up shop when the dollar is low. They know they can save money by moving some of their operations to Canada. They know that not only are their capital and recurring costs going to be lower (or discounted), but also that their labour costs will improve their bottom line. This is especially true of companies that offer North American customer support and sales call centres, because the current trend is going away from offshore customer support. 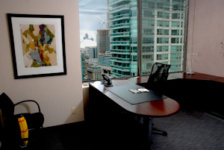 Some American firms looking for inroads into setting up shop or expansion to Canada are not always eager to rent office space that comes with a long-term lease, so they seek out serviced office space at office business centres like Telsec. Brian Miles (President and Owner of Telsec) often says that “The barometor of a strong U.S. economy and a low Canadian dollar, can be measured by the number of office rental inquiries from U.S.-based firms.” But he will also say that when things are tougher economically, that the number of U.S. tenants decreases.